16 Oct 2018 --- Severe climate events could cause shortages in the global beer supply, according to new research involving the University of East Anglia (UEA). The study warns that increasingly widespread and severe drought and heat may cause substantial decreases in barley yields worldwide, affecting the supply used to make beer. This will ultimately result in “dramatic” declines in beer consumption and rises in beer prices. The notion of how big business will contribute to the fight against climate change is one of the key issues being debated after a leading body of experts, the Intergovernmental Panel on Climate Change (IPCC), issued its starkest warning yet last week. FoodIngredientsFirst reported that many key players in the food industry are setting ambitious goals to reduce greenhouse gas emissions and cut down on waste. Climate change is currently a hot topic for the food industry and you can read more on this here. Today, FoodIngredientsFirst has also reported on World Food Day, which is particularly poignant as it comes in the wake of the Intergovernmental Panel on Climate Change (IPCC) report about how business and consumers need to make changes to mitigate the impact of global warming and the fact that this year’s WFD theme is “our actions are our future.” Much has been made of the various sourcing challenges throughout Europe and the rest of the world in recent months as harvests of several crops have been affected by drought. Europe experienced a dry spell and above-average seasonal temperatures, including numerous heat waves, earlier this year. And barley is also being affected, which can affect the global beer supply. In recent years, the beer sector has consumed around 17 percent of global barley production, but this share varies drastically across major beer-producing countries, for example from 83 percent in Brazil to 9 percent in Australia. Results from the new study reveal potential average yield losses ranging from 3 percent to 17 percent, depending on the severity of the conditions. Decreases in the global supply of barley lead to proportionally more significant declines in barley used to make beer. During the most severe climate events, the results indicate that global beer consumption would decline by 16 percent, or 29 billion liters – roughly equal to the total annual beer consumption in the US – and that beer prices would on average double. Even in less severe extreme events, beer consumption drops by 4 percent and prices rise by 15 percent. 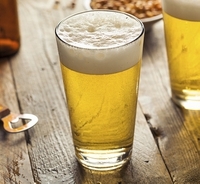 The findings, published today in Nature Plants, suggest that total beer consumption decreases most under climate change in the countries that consumed the most beer by volume in recent years. For example, the volume consumed in China – today the largest consuming country – falls by more than any other country as the severity of extreme events increases and by 4.34 billion liters in the most severe. In the UK, beer consumption could fall by between 0.37 billion and 1.33 billion liters, while the price could rise as much as double. Consumption in the US could decrease by between 1.08 billion and 3.48 billion liters. The international study involved researchers from the UK, China, Mexico, and the US, who identified extreme climate events and modeled the impacts of these on barley yields in 34 world regions. They then examined the effects of the resulting barley supply shock on the supply and price of beer in each region under a range of future climate scenarios. Some countries with smaller total beer consumption face huge reductions in their beer consumption: the volume of beer consumed in Argentina falls by 0.53 billion liters, equivalent to a 32 percent reduction, during more severe climate events. Even in the least severe climate events, total beer consumption in Argentina and Canada decreases by 0.27 billion liters (16 percent) and 0.22 billion liters (11 percent) respectively. Countries where beer is currently most expensive, for example, Australia and Japan, are not necessarily where future price shocks will be the greatest. Changes in the price of beer in a country relate to consumers’ ability and willingness to pay more for beer rather than consume less, such that the most significant price increases are concentrated in relatively affluent and historically beer-loving countries. Their findings show that global and country-level barley supply declines progressively in more severe extreme event years, with the largest mean supply decreasing by 27-38 percent in some European countries, such as Belgium, the Czech Republic and Germany.